As 2017 comes to an end, it is evident that the new movies will contribute to the year of entertainment. 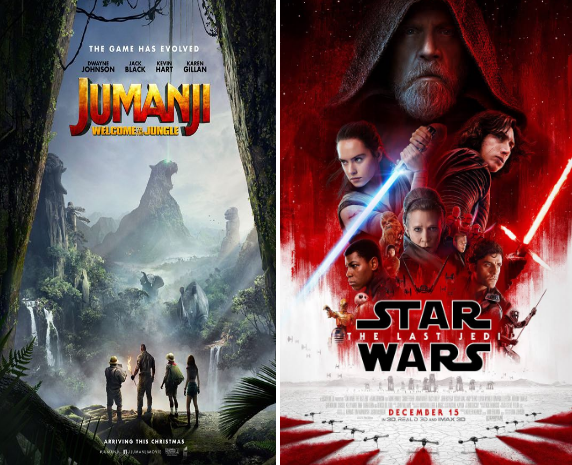 A Jumanji movie reboot and a new addition to the Star Wars saga will make their marks in theaters along other blockbusters such as Stephen King’s It (2017) and edgar Wright’s Baby Driver (2017). Jake Kasdan’s Jumanji: Welcome to the Jungle and Rian Johnson’s, formerly George Lucas’, Star Wars: The Last Jedi are both action packed, family friendly movies set in a time where fictitious characters are both complex and appealing. Jumanji: Welcome to the Jungle is the continuing story of the previous movie Jumanji (1995). In this version, four teenagers, who happen to be stuck in detention, discover a controller for a game they have never heard of before. These kids are then sucked into the virtual world of the game, originally a board game. These four teens must ward off dangerous objects such as animals and natural disasters, or they will deal with the consequences of being stuck in the parallel universe of the game forever. Star Wars: The Last Jedi a continuation to Rey’s journey in Star Wars: The Force Awakens (2015). In this movie, Rey and her team, ex-stormtrooper Finn, fighter jet pilot Poe Dameron, and general Leia Organa. As a group, they must defeat Kylo Ren, the son of recently deceased smuggler Han Solo and general Leia Organa. Both movies are highly anticipated, Jumanji: Welcome to the Jungle has an outstanding count of 5,278 individuals hoping to see the movie. Star Wars: The Last Jedi acquired magnificent poll numbers of 9,908 willing to see it (Movie Insider). Both rated PG-13, Jumanji: Welcome to the Jungle will release on December 20th, 2017, and Star Wars: The Last Jedi will premiere December 14th, 2017 in theatres everywhere.